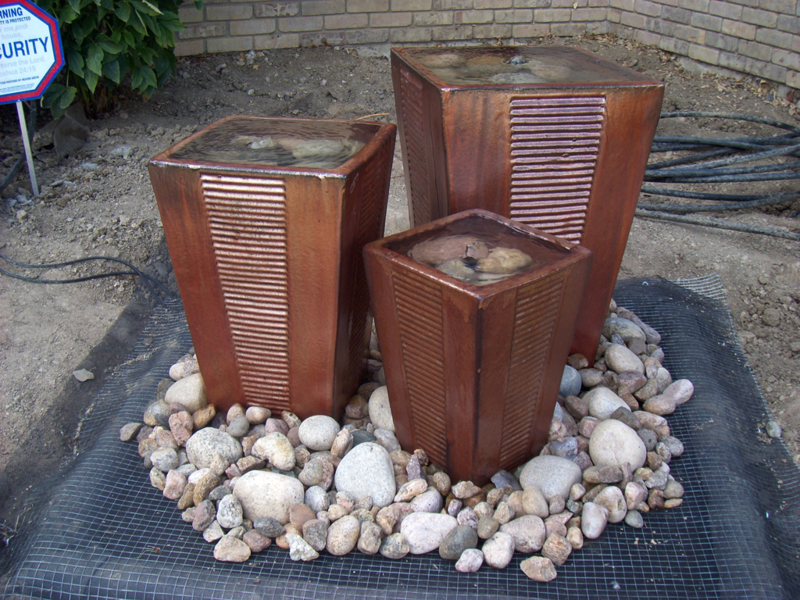 An Overflow Fountain can be constructed of any good, ceramic pot. You can use just one pot, or make a grouping of three. 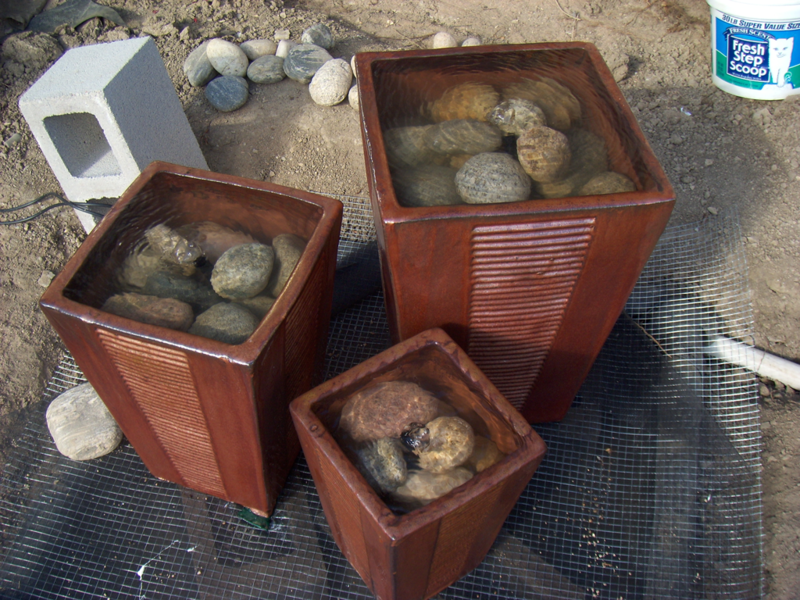 Pots with horizontal ridges make good fountains. It is very helpful to read through all the directions before starting the project. 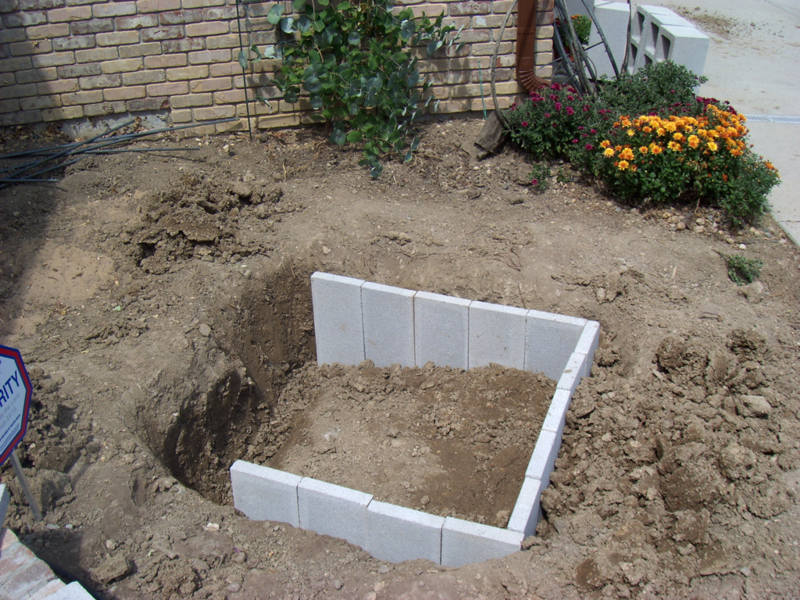 The basic idea is that you will build an underground pond using cement pavers, old carpet and pond liner material. 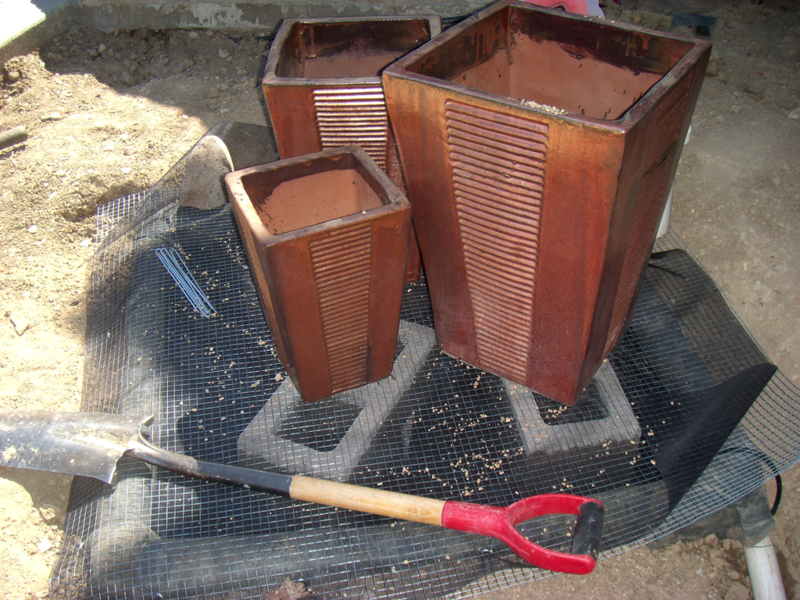 You will use cinderblocks as the base under your pots. 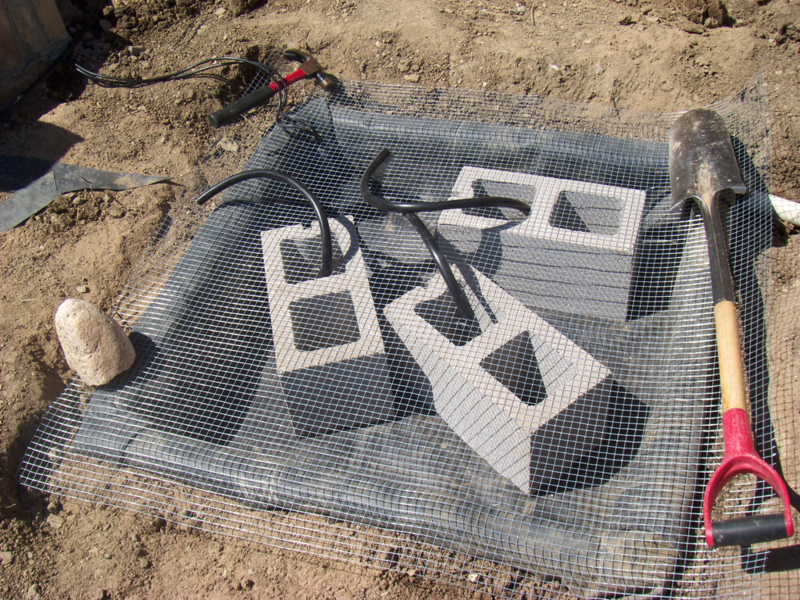 The pond will be covered with wire mesh and hidden under decorative rock. You will need access to electricity for the pump(s). Download the printable PDF of these instructions here. First, start with a nice, cleared-out, level area. Dig a big hole, and create a perimeter of cement pavers. 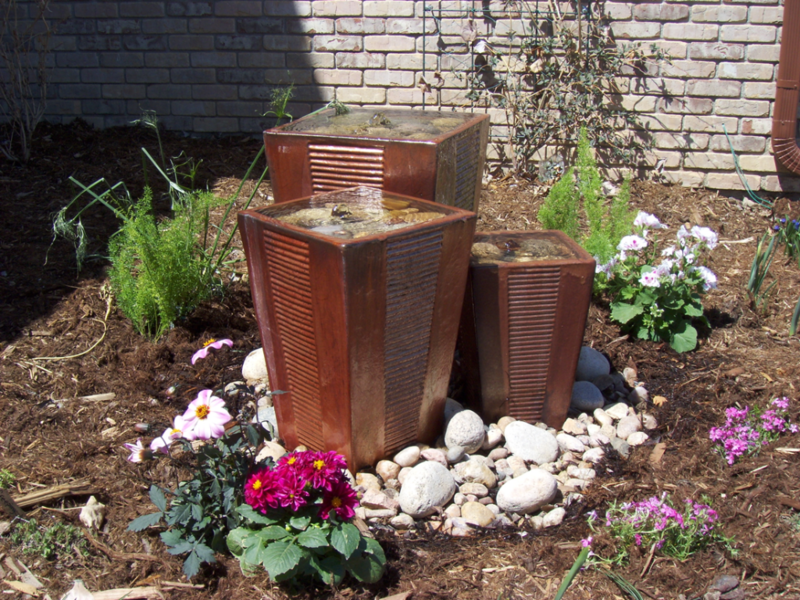 This creates the “pool” of water which will recycle into the fountain. I used 8” X 16” cement pavers. 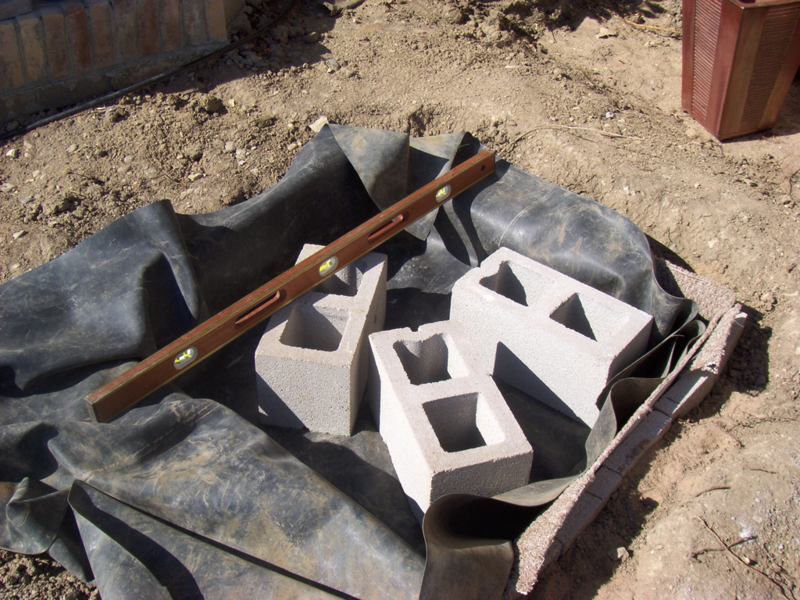 Secure the pavers by placing several inches in a trench and back-filling the trench. 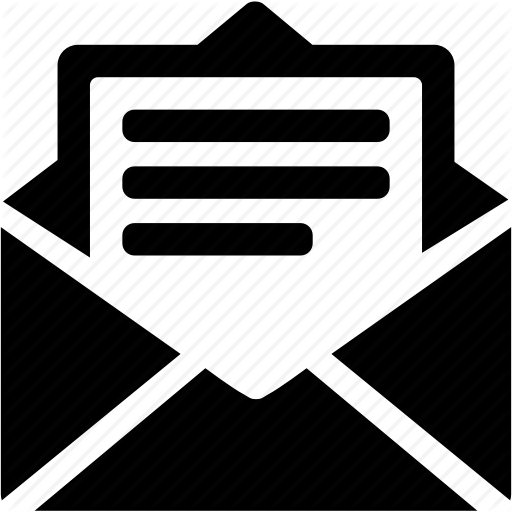 Use a level across the top in all directions. 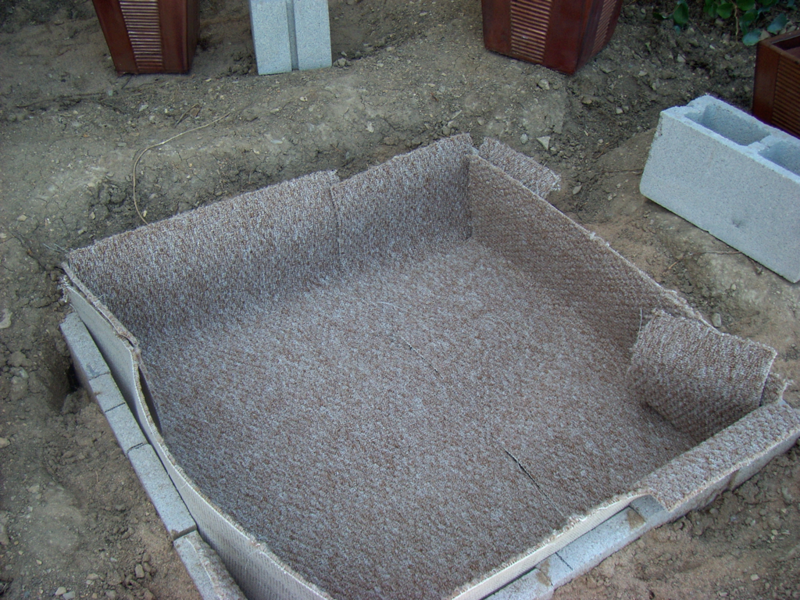 Line the pool with a layer of carpet (old, used or leftover) then cover with a layer of pond liner material. 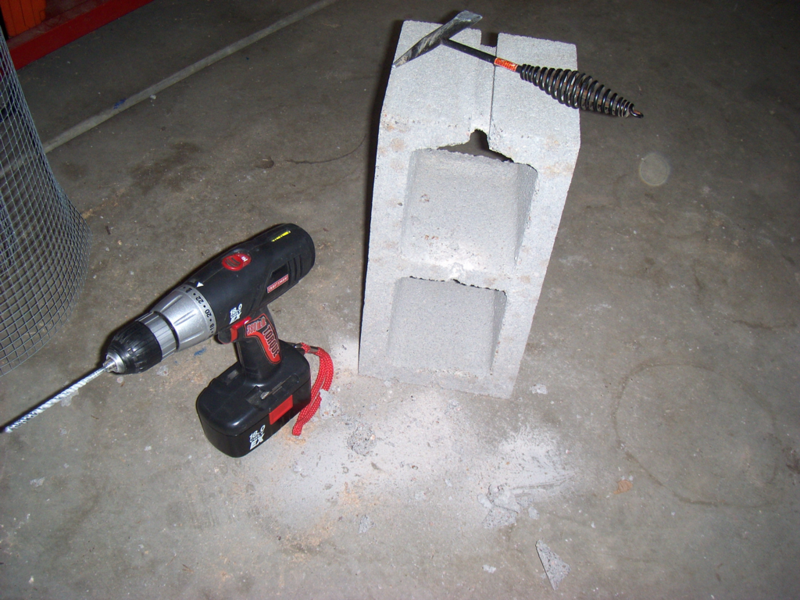 The cinderblocks may need to be modified to make room for the pump tubing which will run up through the cinderblock holes—a chisel or a drill with a masonry bit will do the trick. Determine the set-up of the pots for the fountain. 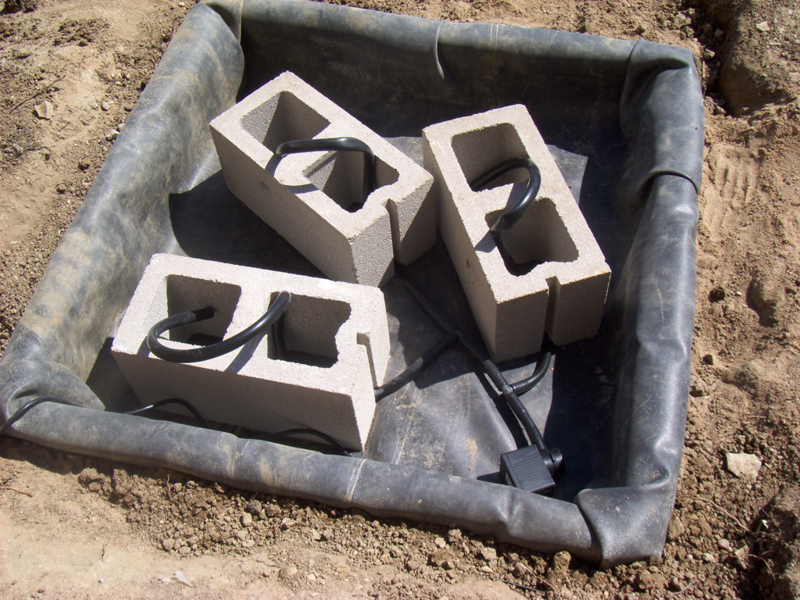 Carefully located the cinderblock/s so the pot/s will be situated on them. Insure that it is level across the top of the cinderblocks and both sides of the pond. 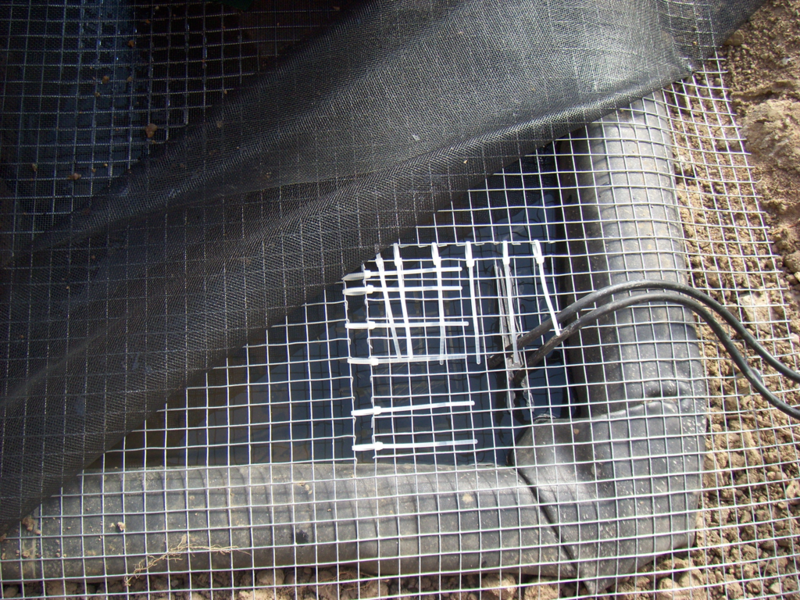 You may need to remove the carpet and pond liner to adjust the level. Tuck in the liner, nice and tidy, around the perimeter bricks. Run the pump tubing up through the cinderblocks using elbows and t’s as needed. Dig a trench for the electric cord, use a PVC pipe in the trench and push the electric cord through the PVC. The electric cord should drop down into the pool at one of the corners. Note regarding pumps: Pond pumps are rated in “feet of head” this means the vertical height the pump has to push the water. So for this fountain with 3 pots, “feet of head” is 3.5 feet (the tall pot) plus 3 feet (the medium pot) plus 2.5 feet (the small pot) = 9 feet of head. That’s actually a pretty large pond pump so I used two pumps—one for the medium pot and one for the large and small pots. If you need to use two pumps, try to separate them by some distance in the pond as each pump creates a bit of a vacuum. Cover the pool with wire fencing or sturdy hardware cloth. This is what the rocks around the base of the fountain sit on. Landscape staples in the soil outside the pond hold the mesh in place. Replace the fountain pots on their appropriate blocks. Cut a little hatch in the corner of the wire for pump maintenance. It is held closed with zip-ties. Fill the pots with medium-sized cobblestones. Fill the fountain with water. 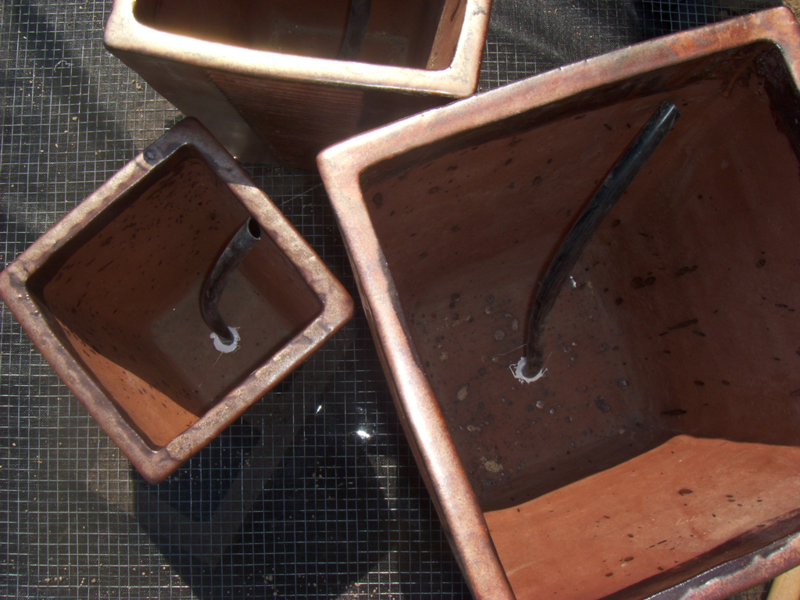 Cut the pump tubing so it is just below the rim of the pot. Test the fountain. Continue cutting back the tubing so it is below the surface of the water where it won’t show. Many pumps have adjustable water flow. Arrange rocks up near the fountain pots. Use a variety of size of cobble stones for a more natural appearance. 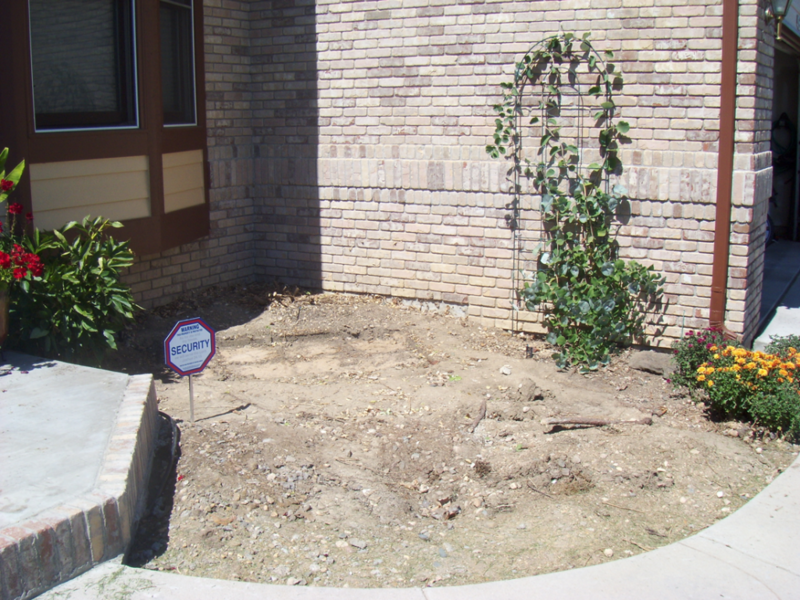 Finish the surrounding area with plants and mulch. You will need to add water to the fountain on a daily or every-other day basis. If the fountain becomes dirty with algae, use an “algaecide” which is safe for birds and fish— available at pond stores or pet (aquarium) stores. You can leave the fountain running through the winter but be sure it always has plenty of water or the pump will freeze. Alternatively, you could turn it off, use the hatch and lift the pump up out of the water to prevent freeze damage to the pump then drain the pots and cover them with a fountain cover or tarp for the winter.